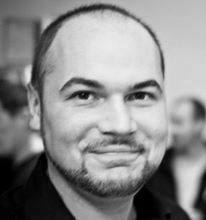 The Ukrainian author and publisher Maxim Prasolov was born in 1976 in Chernivtsi. He studied econimics at the State University of Management in Moscow and the Stockholm School of Economics. Prasolov is a co-founder of the Kiev publishing house Nebeskey. Considered the first Ukrainian »graphic novel blockbuster«, »DaoHopak« [a hybrid word that combines the Chinese »dao«, the way, and Ukrainian »hopak«, an energetic folk dance associated with the Cossacks] is the three-volume saga of a young Cossack, who is trained in the tradition of Chinese shaolin masters to become a »charakternik«, a man of strong character, and a sorcerer and healer for the Zaporozhian Cossacks. When peace is threatened, he is dispatched to save the Turkish sultan’s sole heir. In the first volume of the trilogy, »DaoHopak, I: Antaliyska hastrol« (2012; tr. DaoHopak, vol 1: Antalya tour), he infiltrates the sultan’s palace in Antalya by pretending to be an artist. He is helped by one of the guards of the sultan’s son, a Japanese ninja, who is also a historical reference to the Ukrainian Cossacks, who served as bodyguards at the Japanese emperor’s court. In the Ukraine, the first volume of »DaoHopak« was voted Book of the Year in 2012. The second volume »DaoHopak, II: Shlyakhetna lyubov« (2014; tr. DaoHopak 2: Noble love), having returned from Antalya, the young Cossack’s love for the Japanese ninja is put to the test. In volume three, »DaoHopak, III: Taemnicja Karpatskogo Molfara« (2016; tr. DaoHopak 3: The secrets of the Carpathian Molfar) he sets out for a jousting tournament and meets a miracle healer, who guards the secrets of the Carpathian mountains. Other works published by Prasolov’s company also demonstrate his interest in modern interpretations of Ukrainian heroic myths. Thus in 2013, he published Alexander Komjachov’s graphic novel »Chub« (tr. Forelock) about the adventures of the Cossack Chubenko, and his travels across the universe in a spaceship shaped like the Ukrainian coat of arms. Maxim Prasolov is the publicist for the financial syndicate »Finances and Credit« and a partner of the independent internet channel »spilno.tv«, which has critically monitored all political developments in the Ukraine since 2013. Moreover, he has been a leading expert at the Labor Market Monitoring Center Ukraine since 2015. Maxim Prasolov lives in Kiev.